... 1950 (60 years ago today), at Paris' Théâtre des Noctambules, a new play, La Cantatrice chauve, made its début. The moment has meaning for this IntLawGrrl, whose 1st French textbook featured on its cover a drawing of the title character, The Bald Soprano -- a smooth-skulled stick-figure woman singing her heart out. (Must say, the 1993 cover at left may be even stranger.) 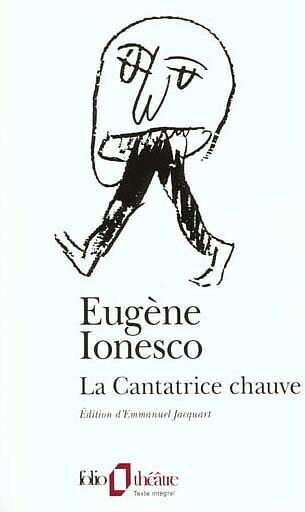 The drawing, like the play contained within (the 1st by Eugène Ionesco, namesake of the 'Grrls Ionesco Awards), was absurd(ist). It offered an odd introduction into a new language for Middle America pupils.